Most of us in our busy schedules do not find enough time to exercise and maintain physical fitness up to the extent of we should be doing. We also often tend to neglect minor pains and bruises until it becomes more chronic and causes significant problems to us. Hence, it is also important to maintain exercise regularly just to stay fit. One of the most chronic body pains that one faces is back pain and it can be really worrying if it prolongs for long. 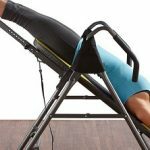 One of the best methods to get rid of it is to use an inversion table with particular exercises for specific pain areas. There are different types of back pains and each has its own specific exercise on the inversion table to get rid from. The compression of the sciatic nerve which exit the spine causes this kind of pain to be generated. 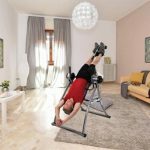 The pain will decrease if the pressure on the nerve is reduced and that remains the principle for exercise on an inversion table for Sciatica. Decompressing on an inversion table routinely can reduce the pressure, hence, the pain. 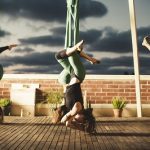 By inverting oneself, the gravity of the body is shifted which helps release the pressure on one’s spine. According to a popular health website, these tables relieve stress by full-spine traction and decompress the flattened spine because of standing or sitting. A compressed spine can result in nerve disorders. Inversion Tables can straighten the spine and reduce the risk of such complications. It is highly important to maintain neutral spine position which requires a strong core but if the abdominal muscles are weak, they cause the hip flexor muscles to tighten up. Other muscle tensions causing improper posture can also be an issue. Decompression and relaxation on the inversion table helps in creating a balance between loose and tight muscles. This occurs when a vertebrate in the spine starts to get narrower and compresses the spinal cord which puts extreme pressure on the passing nerves. Pinched nerves in any part of the spinal cord except the sciatica nerve can be termed as spinal stenosis in general. Decompression on an inversion table helps in reducing the pressure on the spine and hence, reduces the inflammation of the nerves. Muscle spasm is nothing but just your body’s response to injury or any anatomical problems. The muscle reacts to the pain and causes inflammation in that part of the body. Inverted decompression in reducing the pain caused by muscle spasm by elongating and aligning the spine gently. Once the muscle is aligned it then starts to stay relaxed and reduces the problem. Using an inversion table is one of the best ways to get rid of back pain issues without using medical surgeries and anti-inflammatory medications. Decompression and relaxation on an inversion table will help you reduce your back pain problems and also keep you physically fit to an extent.